It’s around 2:30 in the afternoon on a gray Thursday in Fremont. The neighborhood is slow: PCC has endured its lunch rush; the torrent of bikes and cars zooming past on North 34th has slowed to a drizzle. It’s slow everywhere but at Milstead and Co., a coffee bar just west of Troll Avenue. 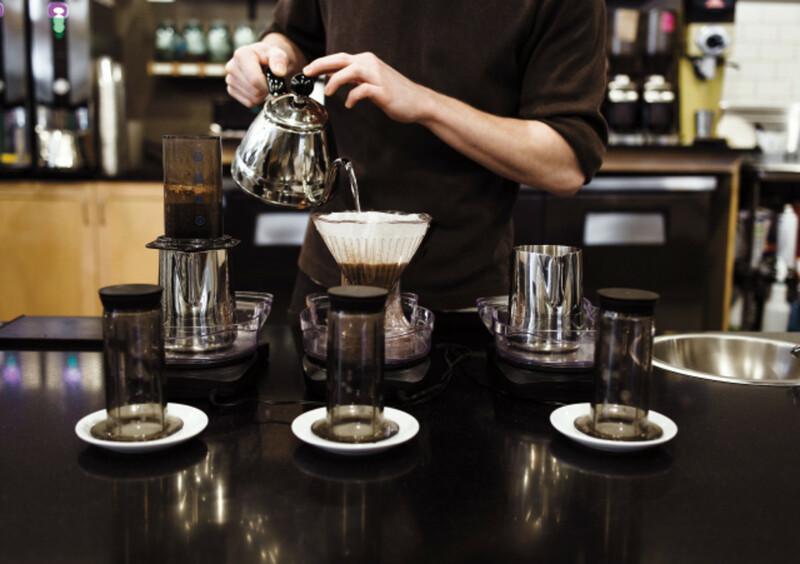 Long, tall tables are crowded with customers, and a half dozen more queue in the entry, where coffee bags and brewing equipment are arrayed in a large wooden display case. The clean white walls echo the hum of the busy coffee shop, with no fewer than 17 laptops in evidence, and even more customers braving bluster to sit outside in the adjoining garden. Here the Aurora bridge looms overhead, and La Marzocco espresso machines hiss and purr. In the center of it all, pulling shots and chatting his way through the line, is the exacting personality who makes Milstead and Co. one of the most highly regarded cafes in all of North America. 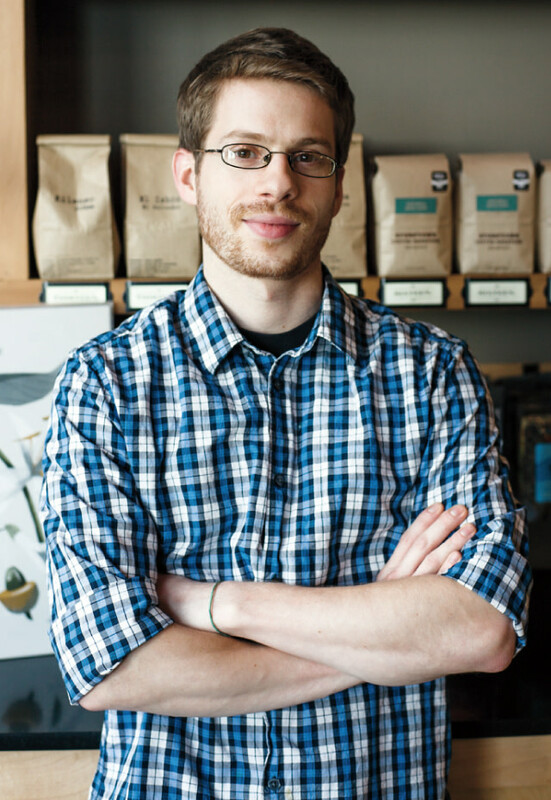 His name is Andrew Milstead, and he wants nothing more than to serve you—and Fremont, and Seattle, and the world—a head-spinning variety of carefully sourced, exquisitely crafted coffee. Traditionally, coffee bars follow one of two models. Roaster-retailers roast their own beans and serve their own product, like a brewpub or a distillery with its own cocktail bar. Starbucks is the classic example, and also Stumptown or Herkimer in Greenwood and the University District and Top Pots all over town. Far more coffee bars are independent, but buy beans from one roaster. Think of Arabica Lounge, serving coffee exclusively from Stumptown, or small chains like Fuel, whose three Seattle locations pour Caffe Vita. Over the last decade or so, a third way has evolved, forged by coffee aficionados devoted to elevating the beverage to new heights. A small league of like-minded boutique cafes has adopted a new model. They don’t roast their own beans and they hold no allegiance to any one particular coffee roaster. Instead these shops stock a variety of specialty coffees from carefully chosen top roasting partners. These are called “multiroaster” cafes, and there are currently fewer than two dozen of them in the United States. This scarcity is no accident. Coffee professionals regard the multiroaster model as the most difficult to pull off. It’s akin to a chef who works with different purveyors from week to week, a bartender who never sticks to the same base bourbon, or a band that plays a different set every night. The target is always moving, the parameters steadily shifting. Even then, most multiroasters stick to two, maybe three suppliers at a time and change their coffees every few weeks; for example Trabant Coffee and Chai in Pioneer Square and the University District. Seattle has a handful of operations that take this model to an impressive level—including Tougo in the Central District. Milstead and Co. buys beans from five roasters, swapping its beans multiple times throughout the day—which is more often than you will likely find in any other shop in North America. Andrew Milstead swaps coffees in and out, making the elaborate process look easy, which it most assuredly is not. “There’s something romantic and valuable about this model,” he says over cocktails at nearby Quoin. “Multiroaster cafes offer a kind of theater and intrigue.” Running this sort of cafe is an insanely complicated proposition, but the process of ordering a coffee at Milstead and Co. is not; neighbors seeking a morning vanilla latte line up amidst the serious coffee geeks requesting pulls of apricot-and-spice-toned Ichimama, a Kenyan roast from Victoria’s Bows and Arrows Coffee Roasters. Making his ever-changing menu accessible to customers is critical for Milstead. “The key is to meet someone where they are, no matter where that is. Don’t tell anyone what they think is wrong. Be nice to people.” It’s an attitude far removed from the caricature of snooty specialty coffee houses. Milstead’s coffee is also an affordable luxury. Cocktail enthusiasts gladly pay $12 or even $25 a drink, but an espresso—even one of the best espressos I have experienced on this planet—almost always runs less than $5 with tip. Born and raised in Frederick, Maryland, Milstead moved to Minneapolis at 17, following his older sister, Rachel. He studied guitar before earning a psychology degree; around the same time he discovered coffee, tagging along with his sister’s boyfriend (now husband) to work at a chain of cafes called Dunn Bros. The city’s coffee scene held a certain adult allure, and Milstead felt “extra cool” for being a part of it. Cool factor aside, he quickly proved himself an apt pupil; in a year’s time he worked his way up to a coveted roasting job at Dunn Bros. Not long after, in 2004, he took his first trip to Seattle. Milstead fell in love with the city, but returned to Minneapolis to help open its first multiroaster coffee bar (serving beans from Seattle’s Vivace, among others). Around this time he started competing in barista competitions. In the already-high-end specialty coffee world, there exists an even more rarefied air of baristas who participate in a global competition circuit. Part professional development, part sport, these competitions help structure the hierarchy of specialty coffee’s inner workings. Those who perform well are granted serious consideration for investment cash, and it’s a major resume chip on the path to landing a job with an established, well-respected coffee company. Winning the World Barista Championship essentially guarantees that within two years, the victor will own a coffee company. The competition has been dominated in recent years by baristas from coffee-producing countries like Guatemala and El Salvador; only one North American has won in 13 years. Milstead fared poorly in his first competition in 2007. He entered another in 2008, placing ninth regionally and in the top 20 at the national event. By 2009 he’d moved to Seattle, having secured a job at Kirkland’s Urban Coffee Lounge, which brewed beans from Stumptown Coffee Roasters. That year he won a major regional latte art contest, came in second at the Northwest Regional Barista Championship (ultimately bumped up to first when the winner abdicated), and placed 18th at the United States Barista Championship, out of a field of nearly 50 of the best baristas in the country. Competing is expensive for baristas, and even more so for their shops and roaster sponsors. Eventually, Milstead thought about what to do next. He considered pushing Urban Coffee Lounge to open a second location or pursuing a master’s in psychology with an eye towards teaching, but instead started dreaming of opening his own coffee bar. He researched service models that inspired him. “I spent every weekend for months at Vivace,” he says. The cafe’s service flow intrigued him; customers went from the pastry case to ordering from the barista at the espresso machine, to finally paying at the register, creating a natural, linear flow. At most cafes, customers stand in line, order at the register, then mill about awkwardly as they wait for their coffee. Milstead took copious notes at Vivace and elsewhere, enough to fill an industrial--size Moleskine notebook. He had money saved; his mother and father, themselves small-business owners, offered to help. Soon a private investor came on board, and in December 2010 the award-winning barista left Urban Coffee Lounge to devote himself to his new project. He considered 15 prospective properties in Greenlake, Ballard, and Queen Anne, until he found a just-vacated space on North 34th Street. There was no trial lease; he signed a multiyear deal. Milstead and Co. opened its doors on September 13, 2011, with beans sourced from a platoon of industry leading roasters, including Stumptown Coffee Roasters, Intelligentsia Coffee and Tea, and Heart Coffee Roasters. On a recent visit, Milstead pulled a shot of Kenya Ndumberi from Portland-based Heart, a coffee dominated by flavors of cherry, cocoa, and plum. It tasted like melted chocolate with a dash of sweet Cheerwine soda—which is to say, spectacular. Milstead considers this to be one of the top two coffees he’s ever served, but it wouldn’t be around for long. While consumers are increasingly aware that the best tomatoes, rhubarb, or even oysters are only found within a certain season, Milstead might casually mention to a curious customer that coffees from Kenya are at their best in the fall. Milstead and his staff spend hours tasting and evaluating new coffees—both the challenge of this approach and the reason he does it in the first place. Of course, this rotating menu comes with complications, and some opinionated regulars. “People will call BS on you,” he says. “You have to be able to explain to people that the coffee they enjoyed yesterday is gone for the season, and talk to them about what they might like instead.” It’s a role that sounds more sommelier than barista. Forty years ago, this city helped thrust words like latte and Americano into the nation’s vernacular, and since then the beverage has become more routine than adventure. But here, under the Aurora bridge, this mild-mannered man keeps Seattle on the coffee forefront.